SETSUBUN, the last day of Winter! February 3rd is the day of “Setsubun”, which literally means “seasonal division”. It refers to the day before the start of spring according to the Japanese lunar calendar. It is said that “oni”, a devil-like creature in Japanese folklore and is known as a character who causes great harm to human come when the seasons change in Japan. Among many rituals to　get rid of these “oni” in Japan, the MAMEMAKI (throwing beans) is the most popular one. 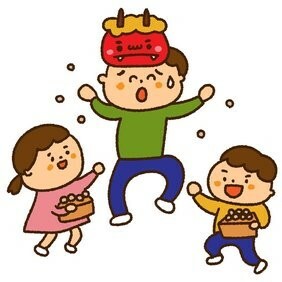 In the night of the Setsubun day, people scatter beans both inside and outside their houses. Usually, the phrase “Oni-wa-soto! Fuku-wa-uchi”, meaning “Devils Out! Good luck In!” is shouted when throwing beans. Afterwards, eat the same number of beans as your age to keep yourself away from illess and stay healthy for the whole year. Setsubun is used to mark the end of winter, but the weather is still very cold in Japan. Please stay warm and be careful not to catch a cold!